I have been promising these thoughts for a while. When you look at all the studies on running economy, the bulk of them are either showing that heel striking is more economical or that there is no difference between forefoot/midfoot vs rearfoot striking in running economy. The evidence does not support the rhetoric and propaganda from the fan boys for the one size fits all. However, if you look closely at the data in these studies there is a lot of variability from one runner to another which means for some runners forefoot/midfoot striking is probably more economical and for some runners heel striking appears to be more economical. Why is that? When you look at all the studies on injury rates between heel striking vs midfoot/forefoot striking or barefoot/minimalist vs shod running, the bulk of them are showing no differences. The evidence does not support the rhetoric and propaganda from the fan boys for the one size fits all. However, there is no doubt that some individuals who changed the way they run are getting less injuries and there is equally no doubt that some get more. Why is that? When you look at all the research on the kinematic and kinetic effects of running shoes and foot orthotics on runners maybe that the mean change is x% with a p value of 0.0x, but when you look at the data on individuals the responses are usually in both directions and are subject specific. Why is that? Clinically, we have all heard the cliché that we treat individuals and not means or p values. There are possibly a number of potential reasons for this individual variability and I will explore just one of them: joint axes variations. This concept has occupied a lot of my time and underpins the work I have done previously on supination resistance. The reason I think joint axes variations are so important is that a variation in the position of a joint axis affects the lever arm that a tendon has to the joint to move it. That in turn affects the load in that tendon (ie injury risk) and how hard the muscle has to work to move that joint (ie economy of action). To explain further, I will start with an oversimplified example or model as a thought experiment to illustrate what I mean (this example is actually wrong and not supported by the evidence for reasons I will get to after the example, but for now lets pretend that its right as it does help with understanding; this is what philosophers of science call an instrumentalist theory and those that read my 2000 paper on the MTJ know all about that!). The variation in the length of the calcaneus (heel bone) is well documented and there is quite a variation from one person to another. As the achilles tendon attaches to the back of the calcaneus, this means that there is going to be quite a variability in the distance between that insertion and the axis of rotation of the ankle joint. These individual differences in lever arms are going to have hypothetical effects. Those with a longer calcaneus are probably going to be able to get the heel off the ground really easy because of that longer lever arm (ie basic physics), and keep it off the ground without a lot of effort. Are these the runners that can easily forefoot strike? Additionally, the load going through the Achilles tendon will be lower as the calf muscles do not have to work so hard. Are these runners at less risk for achilles tendon problems? Conversely, in those who have a shorter calcaneus, the calf muscles are going to have to work a lot harder to get the heel off the ground due to the shorter lever arm. Are these the runners that are more uneconomical when forefoot/midfoot striking? Are these the runners that are greater risk for Achilles tendon problems? Should these runners keep heel striking? While this oversimplified thought experiment is helpful to understand the concept of how variations in lever arms to a joint axis may impact on injury risk and running economy, the reality is much more complex. This model is not supported by the evidence. Two studies ( Scholz et al, 2008; Raichlen et al, 2011) have looked at the issue of running economy and length of the calcaneus and both found the opposite of what the above thought experiment or model would predict. The reason for that is what a potentially more sophisticated version of the model could explain and is related to the energy return that occurs from the achilles tendon during running and the impact of that on running economy. Those with a shorter calcaneus are going to probably store and return more energy and this is possibly a greater contribution to running economy. In the transverse plane the axis varied from 7 to 47 degrees from the midline. In the sagittal plane the axis varied from 20 degrees to 68 degrees from the horizontal plane. This variation from person to person is massive and has to have implications for the way that each individual functions dynamically. There are many different permutations of variations of subtalar joint axis variations (and don’t forget that this happens in the context of variations in the position of the joint axes of all the other joints in the foot … who said foot function was easy to understand?). Lets just take one of those permutations: the transverse plane variability and the variations that will occur in the lever arm to the posterior tibial tendon. If the axis is more medial (ie closer to the 47 degrees), the posterior tibial tendon is going to have a shorter lever arm and is going to have to work a lot harder if it had a longer lever arm is the axis was closer to the mean of 23 degrees. This is obviously going to have significant implications for function, running economy and loads going through the tendon. The posterior tibial muscle is probably the most powerful invertor, supinator or anti-pronator of the foot. If it has a shorter lever arm to the joint that this motion occurs at, its not going to be able to do it job very well and be at a much greater risk for injury. Every case of posterior tibial tendon dysfunction I have seen had a medial subtalar joint axis (and yes I know the plural of anecdotes is not data). In all the runners that I have seen since being aware of the forefoot/midfoot vs rearfoot strike issue, I have never seen a forefoot/midfoot striker with a more medial subtalar joint axis (and yes I know the plural of anecdotes is not data). The reason is obvious, as the posterior tibial tendon also passes behind the ankle joint axis, so also helps get the heel off the ground. If its already working at such a high level due to its shorter lever arms to the more medial subtalar joint axis, its not going to be able to contribute much to getting the heel off the ground – this is going to affect injury risk and running economy. One study has correlated achilles tendon pain to variations in the position of the subtalar joint axis, presumably because of the variations in lever arms that the achilles tendon will have to the variations in the position of the joint axis. This variation could also go a long way to possibly predict why some runners respond to ‘motion control’ features in running shoes and some do not. Also keep in mind that with the variation of each joint axis, each tendon that crosses it will have differing effects depending on the lever arm. The extreme example is the function of the anterior tibial muscle that inserts in the the area around the base of the first metatarsal and medial cuneiform. I like asking the students is the anterior tibial muscle an inverter or everter of the foot. They almost always say inverter as that is what there anatomy texts say. But look at the top diagram above and where it inserts. The anterior tibial muscle is going to be either an inverter or everter of the foot depending on where the subtalar joint axis is – surely that has got to have significant effects on the function of the foot?. Can you appreciate how complex that this is getting and how one size is not going to fit all. Hopefully all of this makes sense. I have only scratched the surface of the topic. I only talked about the axes of rotation of two joints that are modeled as hinge joints. There are a lot of other joints in the foot and lower limb. I recall reading a while back a study in the cerebral palsy literature and I apologize profusely for not providing the reference, as I just can’t find it again! In the study they used MRI to look at the distance between muscle insertions into the pelvis and the center of the hip joint. There was a massive variation in the lever arms between the subjects which had implications for the surgical management of gait problems in cerebral palsy. There is no reason to doubt that the same variation exists in runners and that is going to have implications for running form and how easy or harder it is going to be or not be to change the proximal control of gait. There is so much to do, not only in the modelling of this, the developments of “clinical” tests to better predict responses to these variations and research on the concept. From my perspective: God put me on this earth to accomplish a certain number of things – right now I am so far behind, I will never die. Calcaneal stress fracture – forefoot or rearfoot strikers? Which injuries are probably more common in which foot strike pattern? The new ‘biomechanically perfect’ running shoe from Airia? What is the “best” running form? Is changing footstrike pattern beneficial to runners? What happens during the swing phase that is related to impact loads? ‘getting the heel off the ground’…. Are you saying that h/s doesn’t fall get the heel of the ground? ‘keep the heel off the ground’….. Who recommends this as a running style? Semantics. We been around that stump before. Can you direct me to where this was discussed before please? I don’t see how ‘keep the heel off the ground’ can have any other meaning. Why can’t you answer the original (and simple) questions? Or even provide some of the evidence you are so found of quoting. What question? What I said was a colloquial expression. Others have pointed this out to you in previous discussions. Why do you not get it? I never ‘pedantically’ said people run like that. I never said people recommend anyone run like that. Did I type slow enough for you this time? Craig is right about the subtalar joint axis spatial location having a huge impact on the internal forces and moments acting within the foot and ankle. Medially deviated subtalar joint axes produce greater external subtalar joint pronation moments and laterally deviated subtalar joint axes produce greater external subtalar joint supination moments, which, in turn, affect the internal forces and moments acting on the foot and lower extremity during running. For those who would like to read further about this topic, I suggest you read the following papers and book chapters where I, and my research colleagues, have discussed the biomechanical effect of variations of subtalar joint axis spatial location in greater detail. Kirby KA: Methods for determination of positional variations in the subtalar joint axis. JAPMA, 77: 228-234, 1987. Kirby KA: Rotational equilibrium across the subtalar joint axis. JAPMA, 79: 1-14, 1989. Kirby KA, Green DR: Evaluation and Nonoperative Management of Pes Valgus, pp. 295-327, in DeValentine, S.(ed), Foot and Ankle Disorders in Children. Churchill-Livingstone, New York, 1992. Kirby KA: The medial heel skive technique: improving pronation control in foot orthoses. JAPMA, 82: 177-188, 1992. Ruby P, Hull ML, Kirby KA, Jenkins DW: The effect of lower-limb anatomy on knee loads during seated cycling, J Biomechanics, 25 (10): 1195-1207, 1992. 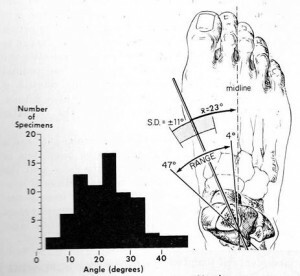 Kirby KA: Biomechanics of the normal and abnormal foot. JAPMA, 90:30-34, 2000. Kirby KA: Subtalar joint axis location and rotational equilibrium theory of foot function. JAPMA, 91:465-488, 2001. Roukis TS, Kirby KA: A simple intraoperative technique to accurately align the rearfoot complex. JAPMA, 95:505-507, 2005. Piazza SJ: Mechanics of the subtalar joint and its function during walking. Foot Ankle Clin N Am, 10:425-442, 2005. Spooner SK, Kirby KA: The subtalar joint axis locator: A preliminary report. JAPMA, 96:212-219, 2006. Lewis GS, Kirby KA, Piazza SJ: Determination of subtalar joint axis location by restriction of talocrural joint motion. Gait and Posture. 25:63-69, 2007. Lewis GS, Cohen TL, Seisler AR, Kirby KA, Sheehan FT, Piazza SJ: In vivo tests of an improved method for functional location of the subtalar joint axis. Journal of Biomechanics, 42:146-151, 2009. Kirby KA: “Evolution of Foot Orthoses in Sports”, in Werd MB and Knight EL (eds), Athletic Footwear and Orthoses in Sports Medicine. Springer, New York, 2010. Fuller EA, Kirby KA: Subtalar joint equilibrium and tissue stress approach to biomechanical therapy of the foot and lower extremity. In Albert SF, Curran SA (eds): Biomechanics of the Lower Extremity: Theory and Practice, Volume 1. Bipedmed, LLC, Denver, 2013, pp. 205-264. There is so much more to running technique than how the foot lands. What is more important is where the foot lands in relation to the hips or center of mass. Stop propagating the idea that running technique is all about foot strike. Where have I ever propagated the idea that running technique is all about foot strike? … unlike like the Chi woo meisters who do propagate the myth that there is one best way to run and lie about the research and just make stuff up… go figure! Oh! the irony of a Chi coach talking about the propagation of myths. Priceless. @Dingle. You need to read more carefully and understand what a “colloquial” rather than a “literal” expression is. @Craig. This is why your blog is so valuable a resource in teaching my students. The comments sections give insight into the mindset of what you call the ‘fan boys’. Michigan. Seems ‘fan boys’ exist everywhere. I’m sure Craig enjoys the mutual backslapping you give each other. Do you even know what or how Damian coach’s his athletes? No, you can only guess and dismiss. As usual the same tired old generalisations and narrow minded opinions present themselves. How can ‘keep heel off the ground’ mean anything else? Please explain for Craig as he is unwilling to let his ego engage with anyone that doesn’t bow and scrape before his greatness. Craig is a heel striker btw. Which is appropriate because he is slow. I am not a heel striker (except towards end of longer runs when fatigued). Why would you make that claim up for? I haven’t made it up I have seen a picture of you running and clearly heel striking. Maybe it’s to the end of the race and you’re fatigued? Btw heel striking is fine if running slow. Don’t know why people are suddenly going nuts about everyone HS Less speed = less force. As long as posture is reasonably aligned and foot contact is close to COG with a decent cadence (170/190) most runners will be fine. As an ex athlete and now coach I’m more concerned with over striders. Not just heel striking over striders! I see more and more fore foot over striders than I’ve ever seen. I think they read Born to Run have their hallelujah moment that natures gonna heal them and start running on a part of the foot which is inappropriate for a given speed. I don’t coach foot contact. Coaching cues are fine as long as there used at the right time Craig. Coaching cues are not scientific fact. Is calling yourself a coach not a bit of a stretch?? You spend most of your time standing in a shop selling shoes. When not doing that you spend it trolling on the internet and posting little anonymous digs at people on twitter, this blog, Pete Larsons blog etc etc. I actually feel sorry for you. Pathetic doesn’t even come close to doing it justice. I have no idea who James is. Clearly your detective work is not up to my level. Although to be honest I am not the only runner who frequents all the above websites to notice your insecure little man jabs at people like Pete and Craig. It didn’t exactly take Sherlock Holmes skills when you repeat the same old nonsense over and over. Quite frankly your online conduct is appalling. I’m sure your employer would cringe if they knew the half of it. So, Mark Richard/Mark Rep/runslow4 or whatever your real name is… Why don’t you disappear back to the shop you work in and leave the big boys to it. You have brought nothing to any conversation I have seen you enter into. Let the likes of Craig and Pete do what they are good at – analysing the science and presenting it objectively. And you do what you are good at – I’m sure there is a till that needs a new roll put in it somewhere? Who is Ian?? A minute ago I was James! Are you just going to keep guessing names? That tells me you are completely missing my point. There are runners who lurk on these sites (and I am merely one of them) who are here to learn and to have access to research we otherwise wouldn’t have. Having you post pointless comments and anonymous digs contributes nothing to the discussion and makes the experience worse for all of us. Stop taking your self so serious and appointing yourself as some sort of weird Knight and remember that opinions are like arseholes everyone has one! Or are one? Now old chap have you anything worthy to add to the debate? If not I’m sure Watson is wondering what happened to his friend. I assure you that if I knew the company you worked for I would be writing them a letter about you. Yes everyone is welcome to their opinions. And the responses to you from my fellow runners on Runblogger suggest they have similar opinions as I do about you. Clever gimmicks of mass distraction yield a cheap soulcraft of addicted and self-medicated narcissists. Have you tried barefoot shoes Emily? Have you calmed down yet Emily? All this anger is not doing the blood pressure much good! Maybe you should go for a barefoot run it might calm you down? Make sure you transition first though! Grow a pair you big girl! Of course you have the same opinions! Look old chap this has been fun. I hope I haven’t upset you to much? Bit of advice from me to you is stop taking yourself so serious and allow people to have their opinion and stop second guessing their motives. Now you call me Emily? How many of these online enemies do you actually have?? And what does that tell you? As I said at the start – I feel sorry for you. Clearly nothing better in your life to do than sit online picking fights and talking to yourself. Good luck with that. First off I really appreciate the pity. Online enemy’s informs me I’m shaking up the sheep.Consider yourself shook up! Clearly you also have nothing better going on as you picked this fight! Doh! Your/you’re grammar policing was also appreciated. Now if that’s all I’m off for a barefoot run! Tatty bye old bean…. You are making a fool of yourself here. You are just coming across as an immature fan boy who is getting pissed off that most of the scientfiic research is not going your way. Get over yourself. How’s Watson old chap? Doh! When walking barefoot, we walk correctly. This means landing softly on the heel and using the power in your toes to push off. When we walk this way we tone muscles, increase sensory perception, improve posture and strengthen core. Wearing traditional shoes with inflexible soles, padded heels, and arch supports prevents this motion, weakens the foot and ultimately causes injury. Fail. I am not Sherlock and I am not a podboy. I am a biomechanics professor and teach the biomechanics of running. You are just a troll that keeps digging a bigger hole for yourself.